Page created and edited by Ryan Ede - Callington Community College. 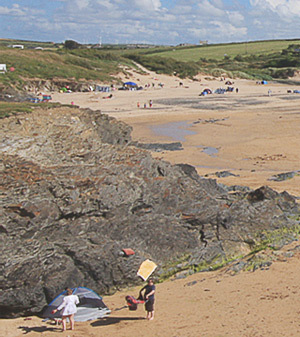 The beach is located on the North Cornwall Coast is a small, pretty cove that is ideally suited for family days at the beach. The bay is located between Porthcothan Bay to the west and the very popular, Constantine Bay its neighbour, which lies just around the headland, to the east. The beach is a narrow "V" shape, with small cliffs on two sides. At the narrowest part of the beach where it meets a small valley there is a stream that runs across the sands. There are also a small number of sand dunes here with Marram grass. Adjacent to the entrance of the car park by the edge of the sand dunes, is a small lookout post for the RNLI lifeguard service. The bay was also the site of the first UK surfing session during the 1950s. The bay is a small sandy beach that is ideal for family holidays and for surfing. The lifeguard service patrols the beach during the peak season. Along the eastern edge of the beach the cliffs are composed of a shale, mudstone. The cliffs here are very brittle and the material crumbles very easily, therefore it is highly advisable not to clamber on them, or if you choose to do so, it is at your own risk. 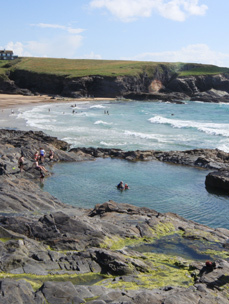 Along the eastern fringe of the cove there are two sea pools. These two pools trap water from the receding tide providing an excellent place for children to swim and play during the day. The low lying cliffs of the eastern fringe of the bay lead to a small headland. All along the cliffs at regular intervals are seats where people can sit and enjoy the view. The road access to the bay is via a very narrow lane that leads off of the main Newquay to Padstow Road. The lane is very narrow and restricted in places, so care must be taken as you approach the bay. There are some passing places along the lane. Once you reach the Bay, you will find the car park is convieniently located in a field on a little rise, located to the right of the entrance road. In the car park by the entrance to the beach, there are a few small kiosks selling refreshments and beach goods. There is also a burger van selling delicous snacks, sandwiches & fries etc. The toilets are located just outside of the car park. From the beach you can walk along the cliff top to the headland between Treyarnon and Constantine Bay. Here there are many seats available in which you can enjoy the beautiful views and the sunset in the evening. From the headland you can follow the path through a narrow lane into Constantine Bay just 100m away (roughly a 10 minute walk). This is the view you see as you follow the coastal path around into Constantine Bay. 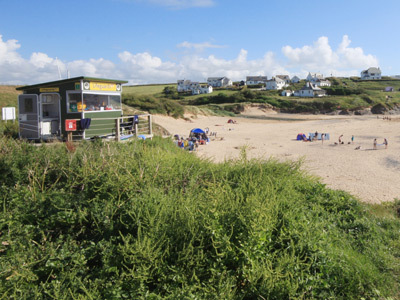 Constantine Bay is also another wondferful beach for the family and by being so close it ensures that neither bay gets too overcrowded, ensuring lots of space to have fun and relax. Constantine bay being only a short 10 minutes away also provides great facilities, although sometimes parking may get a little busy meaning it may be best to park at Treyarnon car park. The facilities at Constantine include a surf shop, toilets, and the lifeguard during the Summer & Easter period. 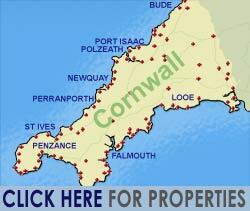 Nearby Constatine in St. Merryn there are also pubs and restraunts available, perfect if you're on holiday close by!